Swimming is one of the oldest known human activities and the oldest records of people swimming date back to around 6000 BCE – but people have most likely been swimming for much longer. The earliest known pool, which was a public bath, was built over 5,000 years ago and people have not looked back since. Swimming pools have always been a way to bring recreational aquatic areas to places that miles away from any lakes or beaches. Today’s pools are larger, grander, and are more like man-made lakes than the average backyard swimming pool. 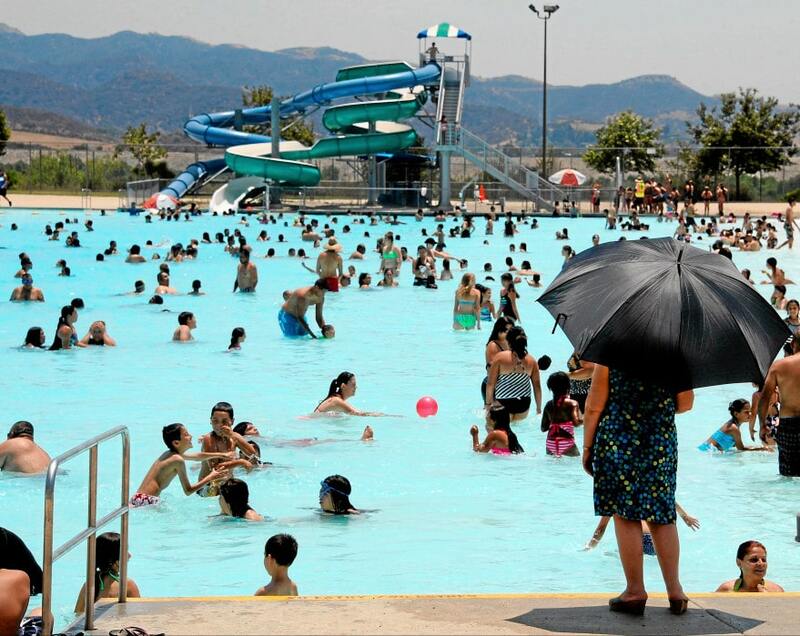 The pool at the Hansen Dam Recreation Center in Los Angeles is the largest pool in the United States. The pool is open to the public and is considered one of the best public pools in California. The Hansen Dam pool has an area of 1.5 acres (6,100 square meters) and is located in the flood control basin near the Hansen Dam. In addition to the swimming pool, the Hansen Dam Recreation Center also houses a 9 acre lake (36,421.7 square meters) where people can fish, boat, and kayak – people aren’t allowed to swim in this lake. The Hansen Dam Recreation Center also has an equestrian center, golf course, and a regular park space for picnics and other outdoor activities. Although the Hansen Dam Recreation Center was built in 1998, it was not the first recreational area built in the area. After World War II, the city decided to fill the space behind the Hansen Dam with sand to create a sand beach and people were also allowed to boat at the lake. Although the Hayman Island Resort is located on the tropical Hayman Island in Australia, the resort has one of the world’s largest pools. 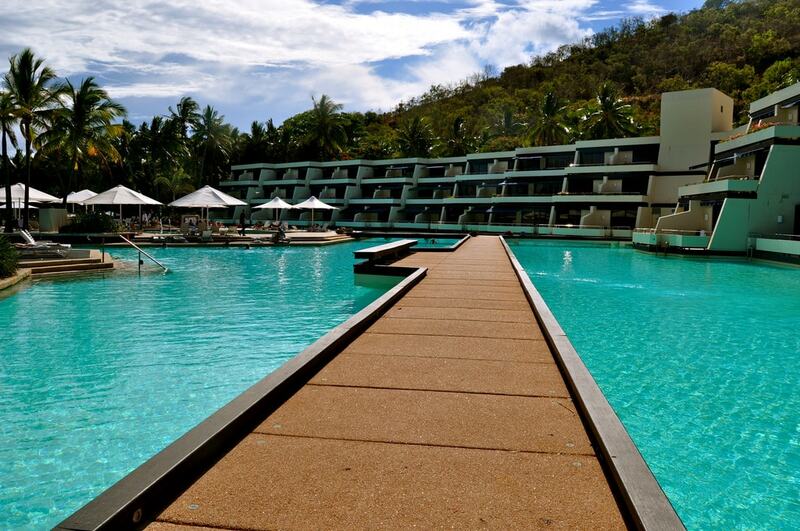 The Hayman Island Resort’s pool is about 1.8 acres (7,284.34 square meters) and many of the resort’s rooms direct access or views of the pool. There has been a resort on Hayman Island, which is located in the Great Barrier Reef, since the 1940s and the current hotel was built in 1987. Currently, the Hayman Island Resort is undergoing extensive renovations following Tropical Cyclone Debbie. The Hayman Island Resort will be re-opened in July 2019 and reservations are now open. Hayman Island is a relatively small island at 400 hectares (988 acres) and is only about 4 kilometers (2.5 miles) long by 3 kilometers (1.9 miles) wide. 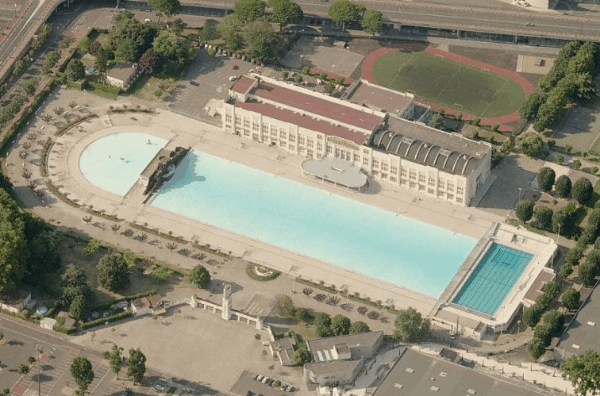 The Piscine Alfred Nakache is not only the largest pool in France, it is also the largest pool in Europe. The pool, which was named after French Olympic swimmer Alfred Nakache, has an are of 1.85 acres (7,500 square meters). Additionally, the Piscine Alfred Nakache is 12.5 meters (41 feet) wide and has a maximum depth of 2 meters (6.56 feet). The Piscine Alfred Nakache is open to the public for a small fee and discounted memberships are also available. The pool also hosts a number of community events and classes for adults and children. Alfred Nakache competed at a number of Olympics, but his most memorable Olympics was from 1948, although he did not medal that year. Nackache was the only athlete at that year’s Olympics who had been put into a concentration camp during World War II. The Dreamworld Fun Lagoon is the largest fresh water pool in the world at 2.2 acres (8,903.08 square meters). The pool is located at the Dreamworld Resort, Hotel, and Golf Course in Karachi, Pakistan and is the largest pool in that part of the world. Dreamworld’s Fun Lagoon is large enough to hold 8.14 million liters of water. Since the pool is so large, people can rent a number of water sports equipment, including canoes, a wrestling ring, row boats, and inflatable slides. In addition to the Fun Lagoon pool, Dreamworld has its own man-made beach, which is the first of its kind in Pakistan. The pool at MahaSamutr, a luxury villa complex and private country club in Hua Hin, Thailand, is the largest pool in Asia. MahaSamutr’s pool is yet another project built by Crystal Lagoon, which specializes in building salt water pools anywhere in the world. 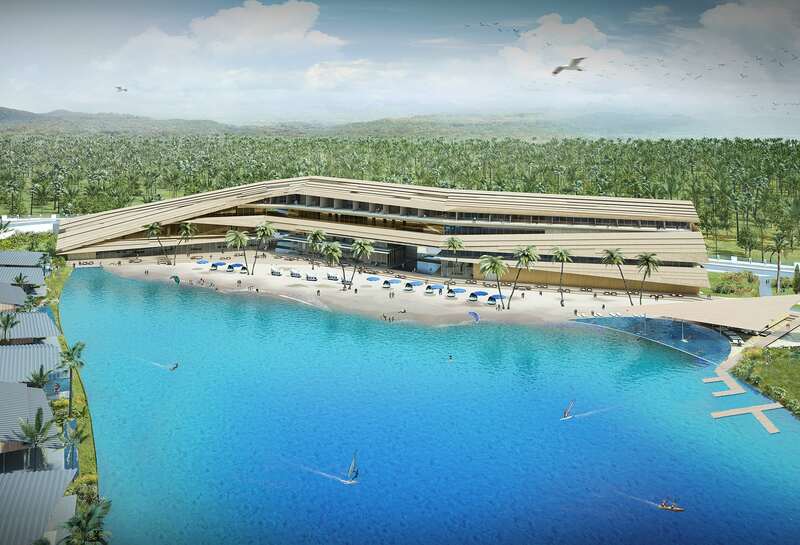 The pool at MahaSamutr is 17.8 acres (72,034.04 square meters) and was the first project for Cystal Lagoon in Thailand. All of the 80 villas at MahaSamutr are waterfront properties as the houses were either built around the lagoon or are located in an “island” at the center of the pool. Each villa has direct access to the lagoon. The country club is also located right next to the lagoon and MahaSamutr’s residents enjoy a lifetime membership at the club. MahaSamutr was designed by renowned Japanese architect, Kengo Kuma, and the villas range in price from $1.2 million – $2.5 million. 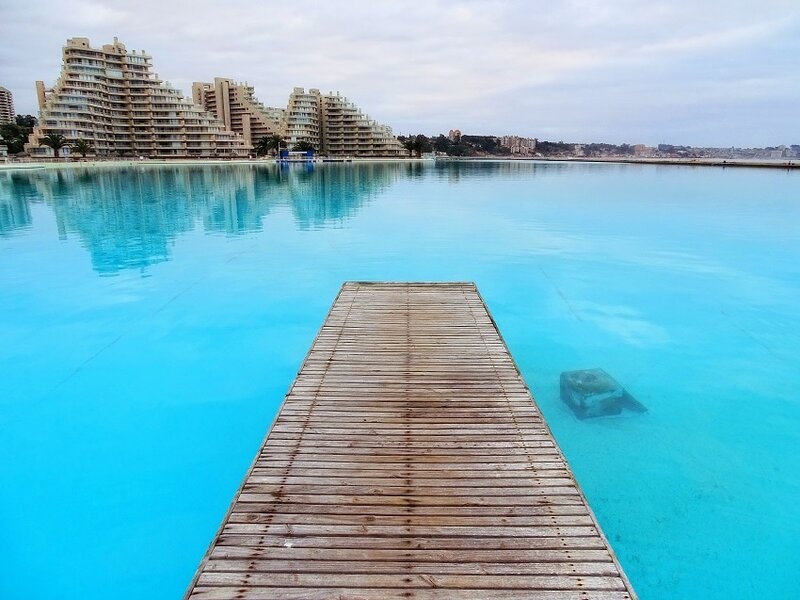 The pool at San Alfonso del Mar was the previous Guinness World Record holder for the World’s Largest Crystalline Lagoon. However, San Alfonso del Mar was surpassed by another of Crystal Lagoon’s projects in 2012. San Alfonso del Mar’s pool is over 19 acres (80,000 square meters) and holds over 250 million liters of water. Like all of Crystal Lagoon’s pools, the pool at San Alfonso del Mar contains salt water. In addition to being large in terms of volume, the San Alfonso del Mar pool is also very long – it is over 1 kilometer (3,280.84 feet) in length, which equals about 6,000 standard 8-meter (26.25 feet) long pools. Initially, the San Alfonso del Mar resort was only supposed to have 400 units, however after the success of the pool, 1,000 more units were added around the lagoon. 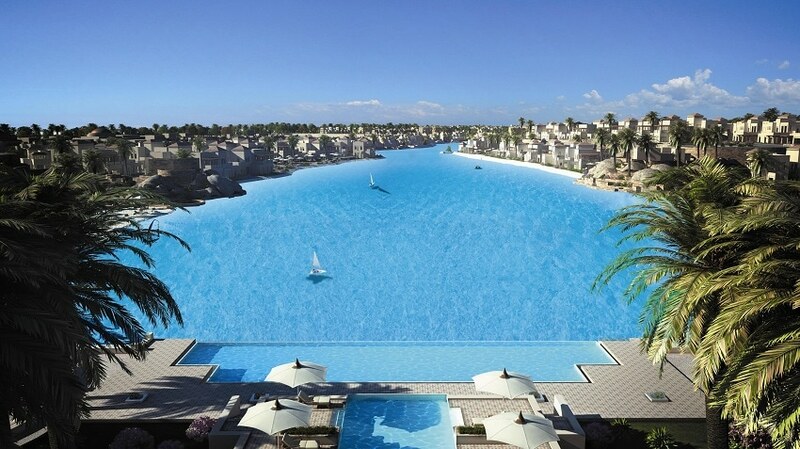 In 2012, Crystal Lagoons built the world’s largest swimming pool at the Citystars Sharm El Sheikh resort in Egypt. Various press releases say that the pool is about 30 acres (121,406 square meters), but according to Guinness World Records, the Sharm El Sheikh pool is 23.83 acres (96,437 square meters). The Citystars Sharm El Sheikh pool is also holds the record for being the largest man-made lagoon in the world. The large lagoon is just one of 12 Crystal Lagoons at Sharm El Sheikh, which have all together comprise over 250 acres (1,012,000 square meters). The Crystal Lagoons are surrounded by 7,000 cubic meters (247,202.7 cubic feet) of sand, creating a beach oasis in the middle of the desert. The Crystal Lagoon at Citystars Sharm El Sheikh contains salt water. The salt water supply comes from wells in the desert, that are otherwise useless.